On a brutally hot afternoon last month, I sat down with Tyler mayor Martin Heines at the city’s new Innovation Pipeline. It’s a beautiful space, housed in an old industrial loft whose well-worn exterior was disturbed as little as possible during the renovation. One of Mayor Heines’s signature projects, the Pipeline is a blend of his interests in preserving old Tyler charm while pumping new energy into the city. I also wanted to hear the mayor’s thoughts on Tyler’s complicated history with race and racial segregation, issues he’s spoken on passionately in the past, including while serving as chairman of the Smith County Democratic Party twenty five years ago. 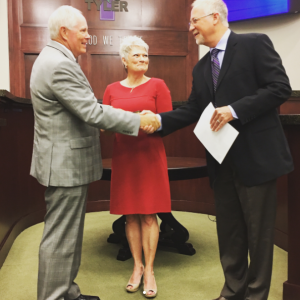 The mayor has lived in Tyler nearly his entire life. His family has a long history in politics and leadership here. How has he seen social issues change in Tyler—and how have his own politics changed over the years? Our conversation has been edited and condensed for clarity and length, but as you’ll see, we let it run long. In a few places, we’ve added editor’s notes with additional context or clarification. It was an unexpectedly open and unguarded conversation, and I appreciate the spirit in which Mayor Heines shared his insights. I started off by asking the mayor how he would explain Tyler to someone who’s never visited. Mayor Martin Heines: I would say Tyler is very tied to its past, but also very different from its past. Tyler has a history of entrepreneurism with many different people coming to our town [initially for jobs in oil and later banking and medicine, and for the colleges], and many of them deciding to stay. It’s really become a wonderful city with so much diversity and energy. Now, with U.T. Tyler’s growth and transformation, we are becoming a college town. Tyler Junior College is doing incredibly well. Texas College is growing. What we’re seeing is the beginning of an innovation economy. It’s kind of surprising for people that have lived here their whole lives to see that, but it’s happening, because the millennial generation is very oriented to entrepreneurism. But along with doing business, millennials want to know the person who made the product they’re buying. They enjoy the camaraderie of that. That’s part of why we’ve worked on this Innovation Pipeline for four years, to serve that spirit. Mayor Martin Heines, center, at a Black History Month celebration. Courtesy City of Tyler on Instagram. So, we’re training that next generation, and more and more young people are coming here not just from around East Texas, as they always have, but even from from Dallas and Houston. I don’t want to train those young people and then have them go back. I want them to do business and find their homes here in Tyler. The Innovation Pipeline is part of that equation, and downtown is part of that equation. Tyler’s going to continue to grow much larger. The question we’re really working on as a city is, how can we hold on to the Southern touch of kindness to others as we continue to grow the way the City of Tyler has always grown, with so much diversity and activity? We continually stress to staff that what we do is customer service. We want to be a friendly, small town; let’s not act like a big city. I think our attitude is really set up well for the millennials, because that’s the approach that they enjoy as well. You’ve said that infrastructure is one of your top priorities. Can you tell us why? We have to make a commitment as a community to reinvest in infrastructure underground. It’s easy to be proud of a new building, but we have to maintain what’s underneath, too. The water drainage system, for instance: we went from a period where we had a lack of rainfall to days when you had [up to] eight inches. That’s brutal on the system, but we had not spent significant money on water drainage since 1997. So we have made a commitment as a city that through our half cent sales tax fund, we’re spending about $14 million over the next 30 years to fix up and study pressure points that we know are hard on the system. Then, we have to get in the habit of incremental work on these items. With the way we in Tyler have decided to fund our city government, it’s imperative to do [repairs] on an incremental basis. If you get behind, it’s hard to catch up. You said that the population of Tyler is going to continue to grow. Can we afford to keep our current thinking around low taxes and how we fund the city? We have no general obligation debt, and that allows us to have a low property tax rate. Most other cities are spending 20 to 30 cents [of every tax dollar] on general obligation debt. We get 1.5 percent of sales tax. Since we are the hub of East Texas, the theory has been that while the region grows and becomes more prosperous, the more that we have shopping and medical here, the more people will come from out of town to spend money here. With Cumberland Village and other places that are really growing well here, people are coming to Tyler to do their shopping. But the one problem with this theory, and the thing that has stagnated us now, is that retail sales have not increased the last two years. The argument could be, well, oil and gas industry is down. That’s a very valid argument. I don’t know how to exactly tell you the dynamics of that. But retail sales have not increased. Could it be due to more online shopping? Amazon now pays sales tax based on the destination of the product. So if you live in Jacksonville, and you used to come to Tyler to shop, that sales tax is not coming to Tyler anymore. [Whatever the reason], it’s going to force the community to really take a look at the percentage of how we do property and sales taxes. Going back in time a bit, I was reading a 1992 print article from the Dallas Morning News that had a quote from you. It was about local outrage over the death of Annie Rae Dixon, an 84-year-old black woman and widow who was mistakenly killed here in Tyler by police officers during a drug raid that went wrong. Do you think that’s happened? Has Tyler moved forward on race since you made that statement twenty five years ago? Have black folks in Tyler gotten that seat at the table? Sorry about that. I’m an East Texas tough guy; we’re not supposed to cry. 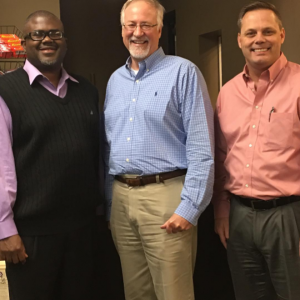 Darryl Bowdre and Ed Moore, we were all involved, and that we’re all on city council together this many years later, I think that makes a strong statement to the community. There has been a lot of change in Tyler. That something Darryl and I have talked about for years. We have seen through the years how education has impacted those issues [i.e., race relations] very much in our community. When I go to events, I always say it’s our moral and ethical responsibility to teach all our children. I also say, if you don’t feel compelled to do so on a moral and ethical basis, you need to be compelled by the fact that a large percentage of the bottom fifty percent of [high school seniors, ranked by grades] are not going to leave this community. They’re going to be here forever. If you don’t care from a moral and ethical standpoint, you need to care due to the fact that they’re going to be your [future] employees, your customers. What is Tyler, Texas going to look like in 25 years if we’re not working to make sure the bottom 50 percent of the class has a skill or trade? Not everybody’s headed for college. I’m so proud of Tyler Independent School District for their Career and Technology Center. That’s opening up opportunities for young people to choose a field that can have an enormous impact on their career and family without a four-year degree. In that quote I read from 1992, it sounded like you were also talking about hearts and minds—the way people feel about each other. When you say Tyler has moved forward on race, do you see that sort of change as well? I see that because I’ve lived it. So much of this stuff is not tangible. You can’t even look at that moment [the shooting of Annie Rae Dixon] and say that was a changing moment. Or that some other thing was a changing moment. I think it’s just time changing things. I feel it everywhere in the community. I feel it. I sense it. There’s not a tangible product. It is very tangible in one way: where people live. 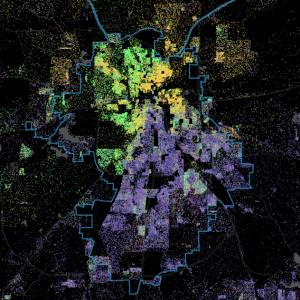 You look at a map of Tyler, and it’s still very easy to see segregation. Black people live here, Hispanic people live here, white people live over here. From a map of racial diversity in Smith County using 2010 Census data published at Hack Tyler. Yes, but what’s fascinating is how much has changed. That map that y’all made [at Hack Tyler], if you were to look at that same picture from 1970, for example, you’re not going to see all the yellow that’s on your map [representing Hispanic residents]. Today, I’d be more interested in seeing a map on economics. I think income has a lot more to do with it now than race. What about this is so emotional for you? [A long pause.] Next question. Maybe I can get there before the end of the interview. You were once chairman of the Smith County Democrats. I know the mayor’s seat in Tyler is nonpartisan. In your personal life, do you consider yourself a progressive? No. And I wouldn’t consider myself a Democrat anymore. Times have changed a lot in politics, and I really do not like how the fringes on both sides tend to control the debate. A lot of us have strong middle-of-the-road feelings. I would be defined more as a conservative just because of my beliefs. But nobody is just a conservative. There’s a wide range of issues that impact someone’s beliefs. I like the nonpartisan position [of serving as mayor] because I feel I’m truly a nonpartisan person. I think it’s extremely valuable to a community to have city council races on a nonpartisan basis. I really get appalled at a lot of that stuff that happens at state and federal government, from both parties. It’s hard to say that now, because everyone defines themselves on one side or the other, and I don’t like it. In my role as mayor, I do have some very strong beliefs about where I’d like to see our community go. But my voice is not the only one that matters. I listen to all the other city council members. I bet 3,000 people have my cell phone number, and nobody’s shy to use it. And that’s good, because I’m not always right. [As for] the Democratic Party, I would say the party left me, years ago. Was that because of a particular issue? No, I think it’s more that the parties went so rigid on social issues, on both sides. I guess it’s easier for both sides to talk about social stuff than it is to face up to the fact that the country’s broke. I would much prefer people to talk about dollars and cents. I’m a business guy, so that’s why I take city finance very seriously. I work on it all the time. When I say that we run the city with the best business-like approach that we can find, it’s because I believe in it, it’s what I work on. Customer service is part of business. I don’t think they can focus on that. I also say, quite often, and I believe it to be true, that the change that happens in this community, the social issues that are dealt with in this community, are really dealt with by the nonprofits. There’s a significant number of wonderful nonprofits in this community and churches and synagogues that work on different issues that they are passionate about. Frankly, I think that’s where social change should occur—people interacting with one another. It shouldn’t be dictated by government. I guess you’d say I’m closer to a libertarian now. Generally speaking, the change that has occurred in this community over time, and will continue to occur, occurs because of people, not because of something that an institution like the city government does or does not do. At The Tyler Loop, we like to talk to people a lot about how has Tyler is changing, and we keep hearing that people sense a growing openness to new ideas and new ways of doing things. What do you think is fueling that sense of change? Do you see it too? I’ve seen it my whole life. [Today], I think it’s being fueled by the college movement. I am not uncomfortable with the fact that my generation is going to be going out of political office, and your generation will be coming in. I think as the millennials come of age, y’all are going to be much more politically active and interested, and I hope you become interested in city government, and come to learn and appreciate it and maybe want to take over. Cause we’re not gonna be here forever. 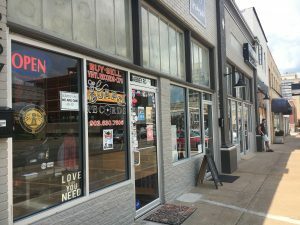 For a lot of people, that sense of change is tied to the new shops along the Off the Square block, just south of downtown. Your real estate company owns those properties. What is your vision for that block? For many years, well before I thought about volunteering for city government, I’ve always had a passion for urban land economics. I grew up in a family that was interested in that. I became interested in it as well, and went to get my formal training in that field. It’s what I get excited about. I started investing in and around the downtown area in the 1990s. The growth of the colleges led us to make sure we were transforming our portfolio to be attractive to that market. How would you describe the mix of business along that block? It’s very deliberate. The idea was that the younger generation wants to know the person that’s making the product, so that it’s more of a creative expression. Millennials value and will actually pay more for a product if they know the person who’s making it. The vintage movement is really strong, so we use as much of the original building as possible, creating the feel of reusing and bringing back to life not only the creation of these small business but the recreation of the downtown square. Your generation is saying, hey, we sense this change. Well, y’all also now have some places to interact, get to know one another, give you a sense of community. This is a project you care deeply about. You’re investing in this block as a private citizen, while you’re also mayor. What would you say to someone who says that’s a conflict of interest? How do you reconcile the two? There is not any sort of conflict of interest. I’ve had my business for a long time, and I do the job of mayor as a volunteer. I don’t have pushback, because people know me, and they know where my heart is. I have not done some things in my private business because I didn’t want to create a conflict. And there are some things that I would have done in my private business if I was not mayor. It’s been a major commitment and time away from my business, but I’m very passionate about my business and what I do for the city. I love the city. I’d like to go back to [the 1992 Dallas Morning News story on Annie Rae Dixon and race relations in Tyler, in which Heines was quoted in support of greater black empowerment]. You mentioned just now that it meant a lot to you to have worked with Councilman Bowdre for so long on these issues. Is that what makes this emotional for you? There have been great leaders before me, and great leaders that I’ve been able to work with for 30 years. I think each one of us in our own little ways has made a contribution. I’m just proud of those guys and what we’ve stood for. I sincerely believe that to be successful as a community and to be good at managing your community, you don’t have to believe the same as the generations before. You don’t have to believe the same as everybody that you’re serving with. You have to set aside all the other stuff that’s going on around you at the state and federal level. The steps don’t have to be defined in political terms, liberal or conservative terms, more just, how can we be of service to all people in our community? Give them the opportunities they want today? It’s really important to me that the people who serve and volunteer for city government are not trying to be the next President of the United States. None of us are going to be that. What we’re going to be is just good servant leaders in our community. And now it’s your generation’s turn.